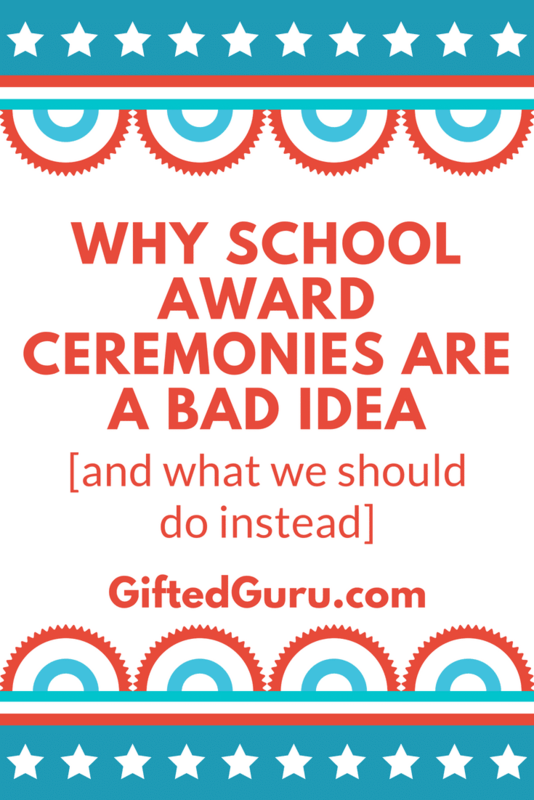 School award ceremonies are a bad idea, but you’d never know it by how many of them there are. Of all the things people warned me about when I became a parent, no one mentioned the interminable end-of-year awards ceremonies. As I’ve learned more and more about the way our brains really work, the more I’ve come to believe that they’re more than just annoying: school awards ceremonies are a bad idea. I’m not going to list them all (this article would go on forever), but here are a few of my top reasons. I’m putting the most important (to me) at the end. The artificiality is obvious. Some of the awards are clearly made up just to make people feel good about themselves. Cue: Most Improved. That’s not an award; it’s a passive-aggressive slight. They’re unfair to kids whose parents are from lower socio-economic classes. Often, they’re held at times that working parents can’t make it. It’s one thing if you’re a white-collar worker who can say to your boss (who is probably nodding in commiseration), “I have to leave to get to my kid’s awards ceremony at ten.” That doesn’t go over very well when the the housekeeper at a low-budget motel says the same thing to their boss. But let’s be brutally honest: our poor kids aren’t getting as many awards anyway, now are they? Ouch. They’re not even fun. They last for.ev.er. The seats are uncomfortable. The kids are squirmy. It’s not great, folks. Sure, a couple of people like them, but most people don’t. When one school ditched them, only two parents complained. That’s fewer than the number who complain when the school lunch menu says pizza when it’s really tacos. Even the awarded kids don’t care. When we cleaned out my much-lauded son’s room before he went to college, literally over 100 pages of award certificates went into the recycling bin. He didn’t even want to scan them and save them digitally. Why? “They don’t mean anything, mom. They make sure everyone gets something, and that’s the same as no one getting anything.” I guess he had listened to my conversations on praise more closely than I’d realized. They’re fake. When I mentioned to a colleague that I was writing this article, she told me her daughter’s friend had just received an “Awesome Softball Player” award at school. What’s the problem with that? She doesn’t actually play softball. Even awards like Honor Roll are fake in many ways. Teachers grade very differently, and a student can work much harder and learn much more, yet have grades that don’t reflect that. What are we really trying to reward here? True learning and hard work, or simply winning the lottery of easy-grader teachers? They’re biased. I’m an educator, and I’ve seen this process at work from the other side. It’s like watching sausage be made. When teachers have to choose students who earn the “Best Student in Fill-in-the-Blank,” it’s like MMA fighting. They can demotivate kids who worked just as hard (or even harder), may have even achieved as much, but since there is only one, received nothing. When you promise that “if you do this, you’ll get that,” but then you don’t get that, it’s a problem. They reward the wrong things. My least favorite: Perfect Attendance. I loathe this award. It should more accurately be called the “Irresponsible Parent who Sent His Sick Kid to School while Other More Responsible Parents Kept Their Sick Kids at Home” Award. See who wants it now. They aren’t what school is about. School is about a bright, promising, prepared future for all of our students. I agree with what George Couros said when he wrote about this: “Schools are not about ranking and sorting. They are about learning and creativity in a safe and caring environment.” Awards ceremonies are not aligned with that mission. And the most important reason: they don’t work. I promise you that not one kid sitting in a third-grade classroom on some random day in October thinks, “I really want to throw this book, but seven months from now I won’t get the Good Citizen Award, so I guess I’ll sit here quietly.” Even kids who sit in the awards ceremony and think they’d like that award next year are not going to hold that thought in their minds through an entire calendar year. Friends, that’s just not how the brain works. Research shows this type of “if you do this, then you get that” reward actually decreases performance. Read Dan Pink’s Drive if you’re interested in the perils of rewarding high-cognition tasks with external reward. We don’t think that way, and pretending that we do is at odds with great education. Schools should not be promoting bad neuroscience. At this school, they replaced the awards ceremony with a whole-school event showcasing what all of the students had done. Parents walked through the school, seeing what students said they themselves were proud of. How do we show our own children we care? In private moments. Let’s do that. When I was an assistant principal, I wrote notes to hundreds of kids. Years later, a young man I didn’t recognize came up to me in a mall and asked, “Were you an assistant principal at Martin High School?” Yes. “You wrote me notes.” Let’s get personal. In our family, Monday night is Family Night. Part of Family Night is that someone is “talent.” Now, sometimes our kids actually played the piano or my husband played guitar or sang. I recited poetry. It was very popular. Normally, though, it wasn’t something formal. Rather, it was something like, “Watch how I can almost do a cartwheel.” In the living room. It was great. Through years of doing this every week, our kids all got to share what they were doing and learning. Show-and-Tell at school is actually a great thing that lets kids share what’s important to them, not just what’s important to us. Consider allowing parents not to have the end of the school year be a scheduling nightmare of ceremonies and concerts and rushing and stress. Consider spreading out concerts. Consider ditching the ceremony. Consider supporting families eating dinner together, rather than scarfing fast food in the car on the way to yet one more ceremony. The research is clear that family dinner is far better for kids than awards ceremonies. Let’s not be the ones responsible for ruining that. Schools can send ideas home in newsletters about ways parents can use effective praise to encourage kids. I’m not talking about the fake, “Good job!” I mean the kind that Carol Dweck talks about, where you recognize kids for working hard and gaining skills. That’s an oversimplification, but you know what I mean. Let’s help teachers and parents learn more about motivational theory and use it effectively and continuously. Let’s set aside this archaic, ineffective, probably harmful practice. Let’s discard the idea that acknowledging we care is saved for one day at the end of the year, and let’s celebrate all of the time. No like button! What do I do without a like button?? 😉 I especially liked the statement about our mission as a school, and how these awards don’t align with that. Of course that’s assuming we’re valuing curiosity and lifelong learning, and not checklisting our way through school. I see checklisting (or in Texas speak, “Getter dun”) as a big issue. In my GT classes, beginning in 3rd grade, they were already programmed to do, hand in, do, hand in. I see it even more in general ed and it’s a constant struggle. Emphasizing curiosity and real learning is so important and should be part of our mission statements! Then it would be too hard to choose an award! Lol! Yes!! Exactly this. I was trying to explain to my colleagues why I was so frustrated with 8th grade continuation. I think I sounded like a lazy teacher trying to get out of an extra evening of work instead of a teacher who doesn’t think it is meaningful to have a continuation from 8th grade to high school. I suggested substituting the continuation with an awards ceremony which is slightly more meaningful. I love the suggestion of the showcase instead! Way more impactful! Another point for a mom who sat just yesterday in a second grade awards ceremony, is that it creates mixed feelings about identy. Example- Mom, I got the most awesome writers award, but I really thought that I was good at math. I guess I’m not good at math, only writing. Identy crisis can hinder GTs from feeling gifted in their talent area because they did not get “recognized” for their talent. YES! This is SO true. Award ceremonies are a nightmare. Embarrassing for those who always win; upsetting for those who NEVER win; demoralizing for those who are close to winning and overlooked. I have seen awards ceremonies devastate teens in my psychotherapy practice, and create unnecessary embarrassment and divisiveness. My own kids knew they were a joke – especially the middle school awards. They won awards they didn’t deserve, and were overlooked for those they did. For example, one child who was the only kid in the school to win a monetary award at the county science fair (and excelled in science) did not win a science award (and they were not exclusive awards – they were given out to any student who did well in science). His teacher was annoyed with him because my son would “challenge” him when his teaching did not correspond with what was in the textbook. Obviously said teacher did not like my snarky, precocious son calling him out. Hence, the “punishment” at awards time. Take home life lesson for my son – teachers can be petty like everyone else. I could go on and on. Thank you for your wonderful points! I totally agree! I sat through my 8th grade daughter’s awards ceremony last week. Like you said, the artificiality is obvious. Oh, yes! And Amen! Two GT students that I knew personally as they were friends of my oldest daughter were so tired of the ceremonies by their senior year that they decided to switch places. Thought being, “If you are so proud of me, lets see if you know who I am”. If admin truly knew these students–both in the top 10% and on the “Principal’s List” for straight A’s all 4 years–it should have been easy. One was 5’2″ and the other was 6’5″. As it was, the principal did not bat an eye as he congratulated them by each by the wrong name and shook their hand. Parents weren’t too happy–but I thought it was funny. They were good kids who did what was right because it was right, not because there was recognition from someone who only knew them as a number on a page.